A recent Pew Research Center survey found that 71% of Americans say there should be a way for people in the United States illegally to remain in this country if they meet certain requirements. The survey also found that overall attitudes about immigrants in the U.S. are more positive than negative, despite the nation’s struggling economy. However, there are partisan differences in views of immigrants. While most Democrats (58%) say that immigrants strengthen the country because of their hard work and talents, only 33% of Republicans agree — a 25-point difference. 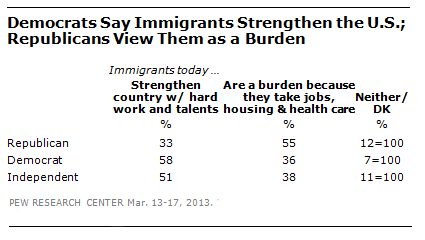 A majority (55%) of Republicans say immigrants are a burden because they take jobs, housing and health care. Only 36% of Democrats hold that view. Independents line up mostly with Democrats on the question, with 51% seeing immigrants as strengthening the U.S., while 38% regard them as a burden. There is also a divide about whether the growing number of newcomers to the United States strengthens society or threatens American values. Majorities of Democrats (61%) and independents (55%) say that the increasing number of newcomers strengthens society; just 34% of Republicans agree.